The Japanese term “wabi-sabi” doesn’t have a direct translation into English, most likely because Westerners tend not to practice the concept. Wabi-sabi is the art of appreciating the understated, for finding satisfaction in humble and bittersweet moments. While Westerners praise perfect lines and symmetry, the Japanese see beauty in imperfection and the weathered effects of the passage of time. Linked to Buddhism, wabi-sabi has a way of making peace with impermanence. 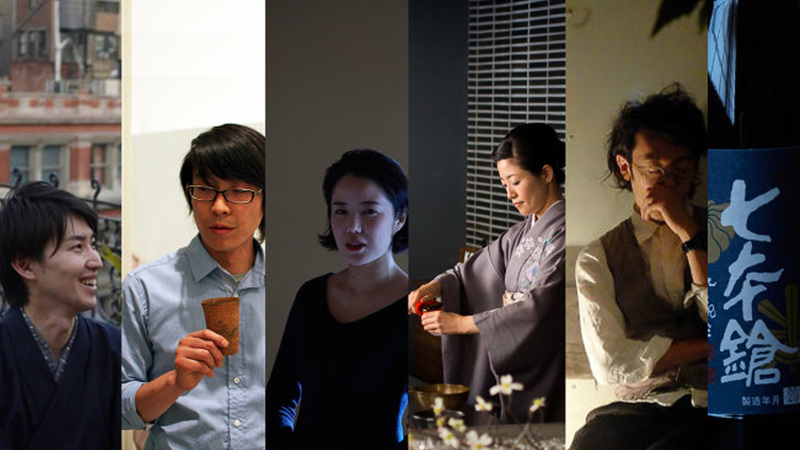 Wabi and Now is a series of collaborative art events featuring seven young Japanese artists who are at the forefront in their respective fields in Japan. Each artist specializes in a discipline that is deeply rooted in Japanese culture: Tea ceremony, calligraphy, flower arrangement, ceramics, culinary arts, sake, and confectionery. Ceramic artist Akihiro Nikaido, calligrapher Satoshi Nemoto, ikebana expert Mario Hirama, kaiseki chef Fujiko Aoki, wagashi confectioner Shiho Sakamoto, sake by Yasunobu Tomita of Shichi Hon Yari brewery, and tea ceremony master Souheki Mori of Tea-Whisk are participating in a unique presentation of wabi-sabi in New York. Wabi and Now shares their individual art pieces with the vision to create one masterpiece as a collective with events taking place at three locations: Cavin-Morris Gallery, Harney & Sons, and KOSAKA. The individual events one or two of the artists, culminating in a special dinner that brings each element together for the perfect example of wabi-sabi. Cavin-Morris Gallery presents the ceramics of Akihiro Nikaido and works in paper by Yuko Kimura. Both artists display a concept known in Japan as Yugen: The ability to suggest, rather than bluntly display. This is an essential aesthetic of delicacy and at the same time, of mystery. The Exhibition Opening Party on Thursday, May 19 from 6:00 p.m. until 8:00 p.m. features an ikebana performance by Mario Hirama using one of Nikaido’s clay vases. Friday, May 20 from 6:00 p.m. until 7:00 p.m. Discover calligraphy’s unique backgrounds, meanings and “flow” with Satoshi Nemoto. As a balanced counterpoint, see flower artist Mario Hirama present the art of ikebana. Gain awareness of how we relate with flowers and the vase as sculptural object, and their relationship to three-dimensional space, in this calm and refined experience. For more information and to make a reservation, please visit the event’s Eventbrite page. Friday, May 20 from 7:30 p.m. until 8:30 p.m.
Four seasons and rural scenery are great blessings to us. See how wagashi, Japanese confectionery, can be created and served as an “interpreter” for appreciating the complex and delicate changes in our seasonal surroundings. you’ll enjoy delicious matcha and exquisite wagashi prepared by artists Souheki Mori and Shiho Sakamoto. Mori will demonstrate the tea ceremony and make matcha especially for you. Sakamoto will show you how to create your own imaginative designs in wagashi confectionery. The event will also feature the latest ceramic tea bowls by Akihiro Nikaido. Flower artist Mario Hirama’s calm and refined performance makes us realize how we relate to flowers, the vase, and the space. For Hirama, the world of flowers is very serene yet extremely powerful because it stems from a vision that seeks to apprehend the very essence of the beauty of Japanese culture. Hirama constantly considers the true significance of IKERU, which literally means the act of arranging flower, to infuse the flowers with life. For more information and to purchase tickets for May 22 or May 23, please visit KOSAKA’s website. Sunday, May 22 from 1:00 p.m. until 2:00 p.m. Enjoy four different tastes of exquisite sake and wagashi on the latest ceramics by Akihiro Nikaido. Hear from participating artists Yasunobu Tomita, the fifteenth generation sake brewer of Shichi-Hon-Yari, and wagashi confectioner Shiho Sakamoto. Tomita will explain the characteristics of the flavor profiles of sake, and Sakamoto will serve wagashi specially prepared for this special occasion. For more information and to purchase tickets, please visit KOSAKA’s website. Sunday, May 22 from 3:00 p.m. until 4:00 p.m.
Monday, May 23 from 3:00 p.m. until 4:00 p.m.
Calligrapher Satoshi Nemoto offers you the opportunity to bask in the pleasure of the beauty of Hiragana. Hiragana was developed from the cursive style of kanji in the beginning of the Heian era (c. 794 – 1192). Its function is to represent sound rather than meaning, and it is used to write native Japanese words as well as verb inflections, adjectival endings, and more. Nemoto will lecture on the unique backgrounds, meanings, and beautiful flow found in hiragana and will deliver a live performance of calligraphy. Monday, May 23 from 1:00 p.m. until 2:00 p.m.
Join wagashi confectioner Shiho Sakamoto to design and realize your thoughts into traditional Japanese sweets. Followed by a tasting with green tea. Sunday, May 22 from 6:00 p.m. until 9:00 p.m.
Monday, May 23 from 7:00 p.m. until 10:00 p.m. The art of the tea ceremony was born in Japan, during the Muromachi era between 14th and 16th centuries. The tea ceremony presents the season of the moment and the master’s thoughts. You can feel the art of the tea ceremony, calligraphy, flower arrangement, ceramics, sake, and confectionery with the five senses, grasp the thoughts of the master, empathize with time and space. Each is an individual art but inside the tearoom, they become one. This is not just “art.” It has a potential value of being something more. This dinner brings together the work of the individual artists into one special event that celebrates the Japanese aesthetic of wabi-sabi.